An armor-supported ISIS division in northern, central Syria has launched an offensive to seize territory from one of the three major Kurdish enclaves in Syria, which have been largely separate from the primary civil war for the past couple years. This area (see map below) is nominally part of the rebel-dominated Aleppo Governorate but lies across the Euphrates River in a kind of sub-district — far from the city of Aleppo itself — long populated with ethnic minorities including Syrian Kurds, Syrian Turks, and Syrian Armenians. Islamic State fighters backed by tanks have captured 16 Kurdish villages over the past 24 hours in northern Syria near the Turkish border, prompting civilians to flee their homes amid fears of retribution by the extremists sweeping through the area, activists said. Nawaf Khalil, a spokesman for Syria’s powerful Kurdish Democratic Union Party, the Kurdish fighters withdrew or lost up to 20 villages in the Kobani region and evacuated civilians with them. Earlier this week, for example, Kurdish fighters captured 14 villages from the Islamic State in other parts of Syria. Now, the Kurds have been forced out of villages elsewhere. 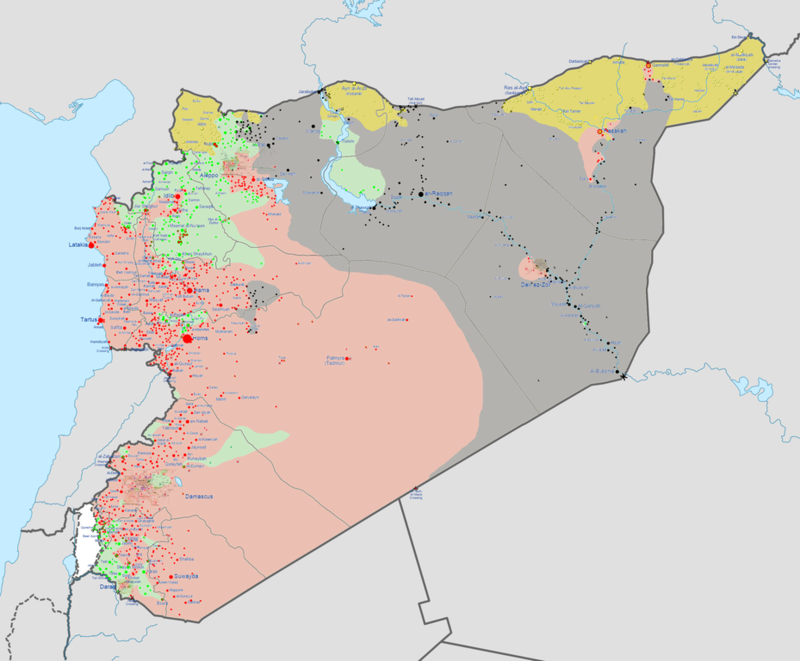 Although the Syrian Kurdish fighters in the YPK have previously been very effective against all comers including ISIS, much of their successes — such as the liberation of the Yazidis trapped on Mount Sinjar just across the border in Iraq — have occurred either in Iraq (not Syria) or in the northeastern enclave of Syria that is directly contiguous with Kurdish areas of Iraq. The porous border and (relatively) friendly presence on the other side allows them more room to maneuver around approaching enemies or simply melt away. Before the rise of ISIS, this presence allowed the creation of a relatively stable, self-governing Kurdish breakaway quasi-state in the northeast under the Kurdish Democratic Union Party. In contrast, the north-central Kurdish enclave where Kobani/Ayn Arab is located is surrounded by ISIS and “moderate rebel” positions on three sides and a largely unsympathetic Turkey with border controls on the fourth. They are mostly cut off from other Syrian Kurds, unless they can cross through Turkey or manage to get through areas now held by ISIS. Depending perhaps on Turkey’s views on the potential future threat posed by the now-beleaguered YPK fighters and the Kurdish villagers they are trying to protect, as well as whether the influential Iraqi Kurdish leadership is concerned about the situation — both of which have a significant voice in setting American military priorities in the region and are much friendlier to Syrian Kurds after months of ISIS advances into Iraq — ISIS tank units attacking Kurdish areas in northern, central Syria seem like a pretty tempting target for American-led coalition airstrikes on ISIS forces in Syria, once those begin in the coming weeks. Our September 20th, 2014 update on this story can be found here. Tagged FSA, ISIS, Kobani, Middle East, Syria, Syrian Kurdistan. « Can Guinea-Bissau’s new civilian president dump the military leadership?